A man has appeared in court charged with attempted robbery in Aberdeen. 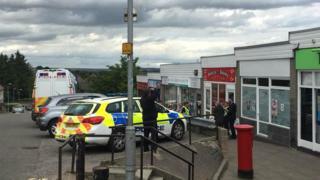 The incident happened at Sclattie Park post office at about 12:55 on Wednesday. Andrew Thomson, 47, of Aberdeen, was charged with attempted robbery and having a blade or point in a public place, when he appeared at the city's sheriff court. He made no plea and was remanded in custody. Police Scotland had said a woman suffered a "minor injury". A 31-year-old man was earlier released without charge pending further inquiries.